In our ongoing efforts to try to make cloth diapering a breeze, we have put together some simple guidelines for essential items that might make the diapering process a bit more eco friendly and manageable. Hooray, if you have decided that cloth diapers are right for you! Now it’s time to get busy and stock up on the basic nursery items that you’ll need to make the diapering process easy and fool-proof for everyone involved! 1. Diapers: If you’re home laundering, plan to purchase at least 36 diapers, which will enable you to wash a load of diapers every two or three days without running out of clean diapers. If you’re going with a diaper service, call to find out how many diapers they recommend you begin with. 2. Covers: If you are using a type of diaper that requires covers, plan to buy at least six covers, to ensure that you’ll always have a clean cover. 3. Diaper Fasteners: If your diapers don’t have snaps or Velcro, you’ll want to purchase at least three diaper fasteners. I found Snappi brand fasteners to be excellent. They hold amazingly well and last at least six months each. 4. Clean Diaper Storage: Decide how you’ll want to store your diapers. I kept my prefolds in a laundry basket on top of my daughter’s dresser. It was great because it was large enough to allow me to lay the diapers flat, which saved me hours of folding. If you’d rather keep the diapers out of sight, consider dresser drawers, collapsible canvas containers, or wall-mounted cupboards. 5. Dirty Diaper Storage: For my dirty diapers, I bought a mesh laundry bag and 13 gallon trash can with a revolving lid. When placed inside the can, the bag kept the mess to a minimum, and I could lug the bag and diapers upstairs to the laundry room with ease. Then, I just dumped the diapers into the washer and threw the bag in, too. 6. Detergent: I used a dye- and scent-free detergent to wash my daughter’s diapers. If you’re planning on home laundering, make sure to purchase an eco-friendly detergent that won’t be too harsh on baby’s skin. 7. Rubber Spatula: If you’re home laundering, a rubber spatula is priceless! Buy a good one to use just for scraping out dirty diapers. Keep it clean and store it with your toilet brush. 8. 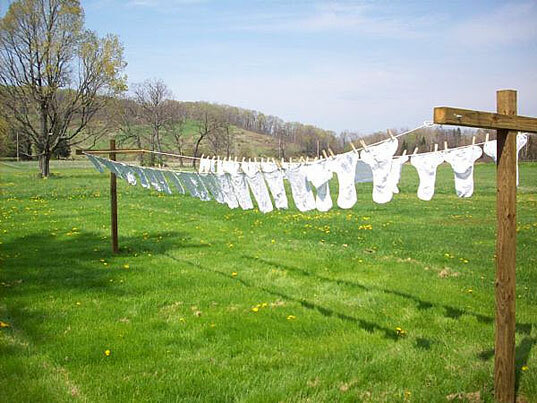 Clothes Line: It’s not essential to hang diapers outside to dry, but sunlight is marvelous for bleaching out dingy diapers. I try to hang my diapers out to dry at least once a month in the summer. 9. Baking Soda: Once again, this isn’t essential, but it’s very nice to have! Just sprinkle a bit on dirty diapers every once in a while, and it will really cut down on odors. Stay tuned, new parents, for more eco-friendly cloth diapering how-to’s! Lead image via Suzannah Paul. Seems a bit contradictory to call it "must-haves" and then say two of those aren't essential. Anyway, I think 12 diapers, three covers, and just 1-2 Snappis are sufficient. I use a drawer in my Ikea wardrobe solely for diapers, have a hanging bag in the bathroom for the dirties, and have a sprayer hose attached to the bathroom sink (I'm not sure how useful a spatula would be with bm poo). Vinegar is an essential part of diaper washing for me. It removes odors and is a natural whitener. Putting stained diapers in the sun also works for me every time, but I just drape them over chairs on my balcony. For the stubborn stains, I use a lemon juice and sun combo. We have something called a little squirt that is a high pressure hose that is attached to your toilet. it allows you to wash off soiled nappies into the toilet really easily. The sun is magical for bleaching them, stains just dissapear. One really important thing is a drying system!, to avoid using the dryer you need a dedicated line (as there will nearly always be some drying) in a sunny spot and another inside for winter and rainy days, have one attached to the ceiling near a heat source means you can hoist it our of the way and it gets all that hot air that rises. All of this makes them sound complicated but when you get your own system worked out it just seems to happen without too much effort. I am so happy with mine! I agree with the sun thing! Amazing! I use the bum genius system and I love them! I think they work better than the big box of disposable diapers that I was gifted. (The box is still full!) I also add a little Borax to the first wash. I wash once in cold then wash again with a prewash...the prewash has soap and the second part doesn't so it is the rinse. This seems to work for me! Hi Suzannah, Thanks for bringing this to our attention. We have credited your photo accordingly!